At just 37 square miles (98 square km) in size, Providenciales, Turks and Caicos may be a relatively small island, but the list of things to do in Turks and Caicos is anything but modest. Whether you are 6 years old or 60, a landlubber or an aspiring mermaid, you’ll find plenty of activities to keep you entertained. 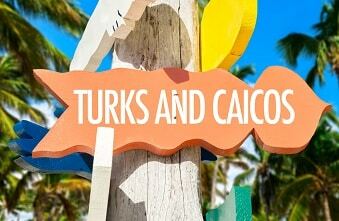 What would you do if you had 40 days and 40 nights to enjoy the Turks and Caicos lifestyle? Here is our list of 40 things to see and do in Turks and Caicos to help to keep you occupied both day and night. From walking along the world’s best beach (Grace Bay Beach) through to playing a round of golf, heading for a bite to eat or even going underwater in a submarine; there’s plenty to do on these luxurious islands! Provo Golf Club is open to both resident and non-resident golfers and is home to an 18 hole championship course which has consistently been voted amongst the best in the Caribbean. A challenging and beautifully maintained course, Provo Golf Club truly is a secret worth discovering for any golf fan. Cycling can be a great way to explore the islands, and we recommend Caicos Cyclery, located on Provo. The offer a range of tours around Provo itself as well as nearby North and Middle Caicos. Their tours range from the relaxing to the challenging, so check them out if you fancy getting a bit of exercise while seeing the sights. Turks and Caicos is also home to a number of historic sites, mainly remnants from the island’s connection to the cotton industry. There are a number of plantation remnants for you to explore, including Cheshire Hall, on Providenciales which dates back to the late 1700s, and Wade’s Green on North Caicos which is the best-preserved plantation in the country. Every Thursday night at Bight Park, local food vendors and entertainers come together to celebrate all things TCI at the Island Fish Fry. Take in the sights and sounds of the vibrant Junakoo while feasting on local dishes such as crab and rice, lobster mac and cheese. The fish fry is definitely not an event to be missed and is one of the best ways to fully experience the culture of these beautiful islands. Of course, you’ll want to take some time out to purchase souvenirs to remember your trip by and find some gifts for your friends and family. While the islands are hardly known as a shopper’s paradise there are some great places to shop if you know where to look. Most of the boutiques are located in the Grace Bay area, such as The Regent Village and Saltmills Plaza and many of the hotels and resorts have their own shops to grab a bit of duty-free. Maskanoo (December) – An annual street festival featuring local food, music and a parade. Culinary Food and Wine Festival (November) – A celebration of some of the fine dining venue that islands are home to and their innovative dishes. Conch Festival (November) – The conch is the island’s number one delicacy and mascot this festival celebrates everything conch related! Wine Cellar Golf and Fishing Tournament (March) – Each March, the Wine Cellar host their own gold and fishing tournament as a way to bring fishing golfing and fishing fans together for a bit of fun, as well as to raise some money for good local causes. Valentine’s Day Cup (February) – The Valentine’s Day Cup promotes the traditional practice of hand making and racing small model sailboats. South Caicos Regatta (May) – The South Caicos Regatta is the islands’ oldest festivals. TCI is home to the Casablanca Casino where you can try your hand at blackjack, roulette craps and poker. It doesn’t matter if you’re a veteran gambler or a completely newbie, anyone is welcome at Casablanca, with friendly staff on hand to explain all of the games. The casino is only a few minutes from Grace Bay beach and the surrounding nightlife. While Providenciales is the main island in TCI, why not take a trip to the surrounding islands? Grand Turk is the historical hub of the islands as well as being the capital island. This is where it’s believed Christopher Columbus landed in 1492, and Cockburn Town is a must for any history buff, as is the Turks & Caicos National Museum and historical lighthouse. South Caicos is another historical island, home to many British Colonial buildings and a number of donkeys and horses who roam the island, a sign of its salt producing past. North Caicos is easily accessible by ferry, and once there you can rent a car or bike and explore at your own pace. It’s also home to a huge flock of pink flamingos! There are a number of courts around the islands where you can try your hand at tennis as well as several instructors who will be happy to help you work on your swing! There’s truly no more beautiful location to enjoy a game of tennis than the stunning surroundings of TCI. The islands are also home to their own riding stables, Provo Ponies. And what better way to experience the island’s beautiful beaches than by riding along into the sunset on horseback. Whether as an adventure with the kids or as a romantic sunset outing, horseback riding is a truly unique way to experience the islands. For a truly unique perspective on these beautiful islands, there’s no better way than to take to the sky in a Turks and Caicos Helicopter Tour. These tours really allow you to appreciate the unique landscape of the islands and their reef systems. You won’t truly appreciate the whiteness of the beaches and the gorgeous turquoise ocean until you see them from above! Grace Bay beach was recently awarded the title of the world’s number one beach according to TripAdvisor and it’s easy to see why. The beautiful white sand beaches are teeming with aquatic life and are the perfect place to take a nice relaxing stroll. To really treat yourself, book yourself in for a spa treatment at one of the islands’ many spas such as the Elevate Day Spa. There’s no better way to kick back after a long day exploring all the many things the islands have to offer! If you simply can’t bring yourself to take a break from your fitness regime, the islands have you covered. Why not take part in a Pilates class at Studio 90 Degrees or some yoga at Retreat Yoga & Wellness Studio. If you want to combine getting a bird’s eye view of the islands with a bit of an adrenaline rush, there are also parasailing services around the island. See the islands from a truly unique perspective as you soar above them like an eagle! The local food is largely based on freshly caught seafood, due to its positioning in the middle of the ocean. Local food is influenced not only by the rest of the Caribbean but also by European tastes and you can try it out for yourself at a number of restaurants including Da Conch Shack in Blue Hills or Bugaloos in Five Cays. Without any public transport, we recommend hiring out your own vehicle to explore the island. There are also no traffic lights to worry about! But do be aware, while many cars are imported from the US and are right-hand drives, drivers in TCI drive on the left-hand side of the road. The islands are home to many street vendors who craft their own wares. Pay them a visit and find out how straw baskets are made. It’s also a great way to find yourself some true authentic Caribbean gifts to take home with you. At our sister resort Blue Haven Resort and Marina you can experience the tastes of their restaurant, Fire & Ice, and have fun at the same time by grilling your own meal with their tabletop charcoal BBQ grills. It’s an experience not to be missed! Once you’re here in Turks and Caicos you’ll want to capture those special memories which are going to last you a lifetime. The islands are home to a number of professional photographers who can do just that whether it’s for a wedding, a family portrait or even underwater photography. The people of Turks and Caicos will really go out of their way to make sure that you have a special time in their country, so why not do a little something to give a bit back to them? For example, the Potcake Place invites visitors to take abandoned dogs for a day and provide some TLC (Potcake is the name given to dogs of the Bahamas and Turks and Caicos). The constant trade winds provide terrific kite flying conditions. At Easter, the annual kite flying competition at the Bight Children’s Park is not to be missed. If you consider yourself to be a bit of an adrenaline junkie, then this activity is for you! ‘The Hole’, located in Long Bay in Providenciales is a 40 foot naturally formed limestone hole. Not only is it worth a visit to witness its immense size, but if you want to test your adventurous side you can also be lowered down on a rope where a swimming hole lies at the bottom. Whether you’re a seasoned pro or even if you’ve never dived in your life, Turks and Caicos is a great place to learn! And with warm, clear waters and such a bright and colourful variety of aquatic wildlife, you’ll be blown away by the islands’ underwater scenery. If scuba diving isn’t quite for you, then why not try snorkeling? Smith’s Reef is one of the best snorkeling locations on the island and is accessible straight from the beach and so much to see! While the islands themselves are awe-inspiring enough, why not go a little bit further and explore the waters surrounding the islands? Half and full day trips are available, with a range of different vessels, some of which feature glass bottoms, with many departing from Blue Haven Marina. So whether you just want a relaxing trip in the sun, or want to go on a swashbuckling adventure, check out the many boat hire companies. If you want something a little more active out of your TCI adventure, why not try out some kiteboarding? The secluded beaches and safe waters of the TCI beaches, as well as the strong winds, make them perfect for this sport. So why not hang out for a day at Long Bay beach and go kiteboarding with the pros? Or if you fancy a more laid back approach to the beach, head out to Taylor Bay and paddle about in the shallow waters. Kids will love the soft sand and clear water while parents are safe in the knowledge that the shallow waters are completely safe. If you want to follow in the footsteps of Columbus and explore the seas of Turks and Caicos by yourself, many resorts offer free use of Hobie Cats, and excursions are also offered by a number of local companies. Stand up paddle boarding allows you to get a really unique view of the islands. Not only is it a good way to keep fit but it also allows you to get up close and personal with some of the island’s wildlife and explore some its hidden spots. Because you’re much higher up than when kayaking, you get a much better view of all of the wildlife. It’s very easy to pick up and a great way to see the mangrove wetlands and shallows, so why not give it a go? If you want to see all that the Turks and Caicos oceans have to offer without getting wet, why not try out a submarine tour? Semi-submarines are available to carry up to 16 passengers of all ages which allow you to see all that the reefs have to offer from five feet below the water. Keep an eye out for all manner of wildlife including fish, turtles and rays. Much of the Turks and Caicos Islands are made up of shallow mangroves, and one of the best ways to explore them is by kayak. Kayaks allow you to get to many areas which would be otherwise inaccessible, and you don’t need any prior experience to take part. For the ultimate day of relaxation, why not pick up a rod and go fishing off the coast of the islands. The deep blue waters are teeming with potential catches and there’s something special about a day out fishing in these parts. Choose from an exhilarating day of deep sea fishing or spend a relaxing day on the water bonefishing. Unfortunately, there’s no cinema here on the island but over at our sister resort Blue Haven you can sit out under the stars on loungers and enjoy the movies like never before. Great food is a must for any holiday, and you’re in luck here at Turks and Caicos, with eateries specializing in food from all around the globe. For such a tiny group of islands, there is a huge amount of fine restaurants including our own Kitchen 218 at Beach House and Fire & Ice at Blue Haven Resort. So whether you want some authentic local grub or the finest in haute cuisine, TCI has you covered. Club Med is an adult-only resort located on the beautiful Grace Bay beach, the perfect place to kick back and enjoy a couple of cocktails or two after a long day at the beach. Club Med is ideal for getting out and meeting fellow holiday makers when the sun goes down the DJs hit the decks. If you’re lucky enough to be in Turks and Caicos in the nights following a full moon, you may get to see this wonderful phenomenon. The shallow waters around the Caicos Banks to the South-West of Provo come alive with millions of glow worms, emitting brilliant flashing green light. It’s all to do with a unique Caribbean mating ritual and you can find out more at sailatabeyra.com. Finally, one of the simplest things on this list. Simply sit back on your hotel balcony at the end of a long day and bask in the wonderful starry night sky and think just how fortunate you are to be on these glorious islands! No matter how you spend your vacation in Turks and Caicos know this – boredom is not an option! Stay at the all-inclusive Alexandra Resort, centrally located on the #1 beach in the world, Grace Bay beach. With so many things to see and do, the only question you should ask is how many vacation days you have available to enjoy paradise.